Expected 8 to be 7. 09 01 2016 16:38:00.513:INFO [watcher]: Changed file "D:/Users/Damir/Temp/Karma/src/add.js". Open the file as a new project by clicking on File > Open... and selecting the root folder with all the files. A new configuration is added by clicking on the + drop down and selecting Karma. Select the path to the karma.conf.js from the Configuration file. Running the created Karma configuration will run the tests and display the results in a nice tree view display. WebStorm by default doesn't run the tests automatically. Instead you need to press Shift+Alt+R. You can enable automatic rerun of tests by clicking the icon below the green arrow to the left of the tree view. This will cause the tests to be automatically run again whenever the files change. You don't even need to save the file in WebStorm to trigger them. 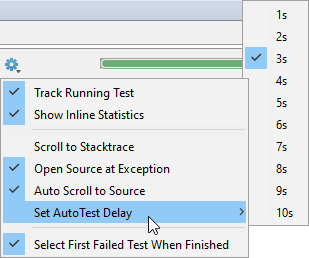 There is a Set AutoTest delay setting in the dropdown with the gear icon to change how long you need to be idle before the tests are run again. If you debug the Karma configuration instead of running it, you can set breakpoints in your source or test code to break into the debugger when tests are run. You need to have a special Chrome extension installed, though. in Visual Studio 2015 I had no luck getting to run Karma tests properly with the free Karma Tast Adapter. Chrome browser started, but the progress indicator in Test Explorer window kept spinning indefinitely with the list of tests shown or even without it. Judging form the Q and A section on the gallery page for the extension I'm not the only one with these issues. The tests can be run from the same Unit Test Explorer window as any other tests in ReSharper. I couldn't find a way to debug them, though. The option was always disabled.